College Galatta will be website which would contain various topics from Education, books, electronics, programming, review and many more. Website will specifically meet needs of a student. Please find the recommended books which you can refer for Mechanical Engineering ( Mech ) paper in GATE Examination.Books contain solved previous year question papers with answers. You can download/buy these books from various websites and also you can get the PDF various of the same. Books which you can refer for GATE examination. There are various books in the market. If you want to buy any books mentioned below please click on the book name. Ebooks for GATE can be download from some other website. Download recommended/reference Books for BHEL examinations. There are many books which you can read for clearing the examination conducted by Bharat Heavy Electrical Limited ( BHEL ) for the post of Engineer\Executive Trainee - ET, Assistant Engineer - AE, Assistant Foremen - AF, Engineering Assistant trainee, Senior Engineer, Manager, Deputy Engineer, Contract Engineer, Supervisors, Project Engineer and Graduate Apprentice trainee in various Engineering division recruitment examinations. You can also refer other PSU exam books and GATE books for increasing your chances of clearing the exams in flying colors. India's largest phone manufacturer just release it next flagship aiming at better quality and design. Which is kind of lacking from Micromax and also user perception that micromax phone are of low quality and not meant for longer use. In the quest for achieving better quality in the phones it release, Micromax started to release phone such as Micromax Canvas HD, Canvas 4 and Canvas Turbo all had better quality than its predecessor. Micromax Canvas Knight A350 has a glass and metal body in with Gorilla type glass. The camera protrudes in the back, res all is smooth glass. The design looks similar to Sony's Xperia Z, except the knight has some resemblance to iphone. The phone is slim compared to other Micromax phones. So using and holding the 5 inch phone is quiet easy with just one hand. The down side of having a glass is it easy to get scratches, but the material looks and feels great. Micromax Canvas Knight A350 has a 5-inch screen IPS LCD screen with a FullHD resolution of 1080 x 1920 pixels. For a phone that costs less than Rs 19,000, it has a very good screen with good colours, viewing angles and level of brightness. It quiet good when you are using phone in bright sunlight. The response is good from the screen. Micromax Canvas Knight A350 uses MediaTek's MT6592T processor. It is a 8-core processor capable of running at 2GHz. This processor uses A7 architecture from ARM which is aimed at providing mainstream performance and not high-end performance. MT6592T is fast processor, capable of handling the everyday work load with ease. Combined with 2GB RAM and 32GB internal storage, Knight A350 will be good for web browsing, multimedia videos, photo editing, gaming and day to day activities. There is a mono speaker, it is very loud.For gaming we have Mali 450 for graphics processing. Most of the current games will run smoothly with this. Micromax Canvas Knight A350 runs a bit older version of android which is 4.2.2. This along with the customization of the software which Micromax provides.That is an older version of Android - the latest one is Android 4.4 - but in terms of features there is not much difference. There is a translucent background in the app drawer. the phone comes loaded with apps like BBM, Hike, TrueCaller and Kingsoft etc. Micromax Canvas Knight A350 has a primary camera with 16MP lens. The camera in Knight A350 is a good. In good light, it clicks images that have lots of details and right amount of contrast. But as good as other phones like sony, xioami, etc.Front camera has a 8MP lens. But big number really dont turn to good performance. Overall the camera department is just average. The Knight A350 is a good phone with neat design and some interesting hardware. The camera is decent. The looks, screen perform good for its class. Given that the price is around Rs.19k this would not be a good budget phone, but a sure buy for people who wants to move to bigger screen from older micromax devices. When it comes to budge friendly we have Moto G, Xiomi Mi3 , Panasonic and Xolo knocking off micromax in price and quality. Be wise enough to do your homework before you buy your device. 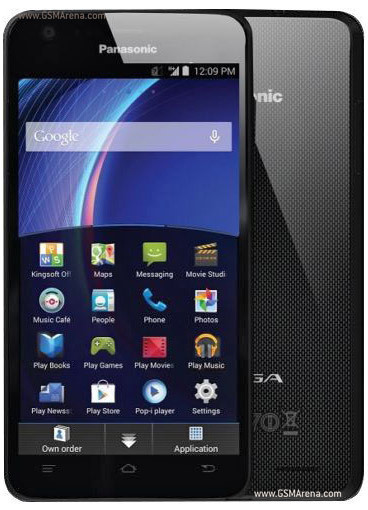 Panasonic India launched its latest dual sim flagship andriod smartphone at a price range of Rs.18000. The smartphone is named as Panasonic Eluga U. This phone looks like a perfect bit in the asian market with clean designa nd looks. This should good competitions for Samsung, HTC, Micromax, etc. Here is my first impression of the phone and its features. Eluga U stands for "Elegant User Interface Gateway" which is quiet complicated number. The design of the phone is good and quiet as expected from a Japanese manufacturer. It has a slim unibody and a glass finish at the back. Hope the glass finish doesn't get scratches. In the left there is a microSD and dual SIM tray. On the right side there is power and volumn controls with rather big space between them. And there is not visual marks that says which key is for what, this might confuse the users. The overall build and quality is good for the price range. Panasonic Eluga U comes witha 5" IPS display with resolution of 1280 x 720 pixels. The touch response and viewing angles are good. Panasonic has modified the OS to enable landscape mode view on the home screen, a feature usually not found on Android devices. The screen is protected by the Corning Gorilla Glass 3, which is good to have. Panasonic Eluga U runs a 1.2Ghz quad core Qualcomm Snapdragon 400 processor with 2GB RAM. There is 16GB of internal storage with the microSD card supporting up to 32GB. There is a non-removable 2,500mAh battery, 3G, WiFi, Bluetooth 4.0 and bunch of sensors to support various apps. There is 13mp shooter at the back with LED flash. The Eluga U runs a customised Andriod 4.4 kitkat software. Users can assess all there apps from the home screen with its its new FitHome UI on the Eluga U. This is good, but not a Wow feature. Best part for the user is it allows user to switch the UI to stock android if you dont like the FitHome UI. Apart from this everything else is standard in the software side. With Snapdragon 400 running at 1.2Ghz the phone has good response and also the support the processor with a 2GB Ram which makes this phone lag free and also most of the games would run smooth like butter. So running games, HD movies would not be an issue. But need to check if the phone slow downs as more apps are installed. The Eluga U has a 13MP autofocus primary camera and a 2MP front camera supported by LED flash light.Camera is good, nothing exceptional. Now a days 13MP is becoming a industry standard for this range of smartphones. Phone is a good buy for first time users. But i would not prefer this if i already have a stock andriod OS. Not to forget India is becoming very competitive with smartphones with have micromax, Xiaomi, Motorola, Xolo . They are bringing in more better spec phones at a very cheap price. Xioami has a phone with a better hardware at just Rs.14K. So i would suggest you do some research before buying this phone. Please find recommended books for various bank exams conducted every years by banking institutes of India like IBPS, SBI or respective banks. There are many PSU banks and private banks which conducts recruitment exams yearly to file the posts like Management Trainee, Probationary officer - PO, Specialist officer - SO, Clerks, Assistant, Managers, Assistant Manager, Junior Scale officer, legal officer and Securities officer. You can find books with solved answers, answer keys, modal question paper, question bank, question papers on reasoning, aptitude, general knowledge, technical papers and materials required for clearing the exams. Scroll down for books for different banks and click on the link to respective banks the books. As you have seen, there are four test sections in the Aptitude test of SAIL exam. You can therefore buy the book according to your need for improvement from the list given below. Here is the list of recommended books which you can refer for all the PSU and government exams. This is not a free download. The link will take you to websites were you can buy the books. Verbal & Non-Verbal Reasoning is of great use to students preparing for a number of entrance examinations, whether it be for an MBA or for a job in the Civil Services, PSUs and government exams. It will also be useful for students writing exams to get jobs in banks, the tax department and the railway department. Here is the list of preferred books which you can refer for compitative exams, PSU exams, UPSC / State PCS / Bank Clerk / PO / SSC / CDS / NDA / Railways / Armed Forces / DSSSB / MBA and other government exams. This books can be download or bought by clicking on the links below. Xiaomi has announced Mi3 in India, which now has been launched for Rs 13,999 instead of the original announced price of Rs 14,999. The company had made this announcement last week, but along with the Mi3 the company has announced that the RedMi 1S, and RedMi Note are also coming to India for Rs6,999 and Rs 9,999 respectively. According to the company, the RedMi 1S andRedMi Note will be launch soon. The Mi3 is up for pre-registration today and the Mi3 will be available via FlipKart on July 22. If in case you are in a dilemma whether to by the phone or not. Here is a quick review of the feature that this mobile has and also my thoughts on the device. We all know that Xiaomi is very famous for selling large number of smart phones on the release date. This is the third flagship smart phone that Xiaomi is releasing which is named as MI 3. The MI 3 is a beast if we look at the specs (hoofffff) and that too for such a price tag. Are they joking??? No they are not, given the price MI3 gives back too much for the user to play with. And keeping Indian customer in mind, i believe this is a game changer. Now coming to its features, plus points (i know price is a plus) and draw backs. We have a dragon here for sure. Just kidding. The display comes with 5-inch IPS display which is Full HD at 16:9. Thus it would give crisp details in 1080p HD video or rich textures in 3D game environments. Your photos look more vibrant in your hands now. The screen also comes with anti-glare coating giving you high screen readability. The IPS (In-Plane Switching) technology delivers stunning colour consistency around different viewing angles. Mi3 comes with 13MP camera at the back and 2MP camera at the front. The built-in Phillips dual-LED flash quickly adds the perfect lighting to make your subjects beautiful. Never miss another photo opportunity again. Mi3 will produce amazing photos in low light with a super-large Exmor sensor and an f/2.2 aperture by allowing 30% more light into the sensor. It is said the specification by Xiaomi that Mi3 would last for 500 hours of standby time, 50 hours of music playback, 25 hours of talk time, 21 hours of 3G Internet use. Mi3 has a 3050mAh lithium-ion battery. Mi3 comes with a Dual-band Wi-Fi (2.4Ghz/5Ghz) gives you the room to go wireless and still enjoy high speed Internet access. Supports 3G(WCDMA) and 2G(GSM) networks. NFC (Near Field Communication) gives you the contact less freedom to augment your digital lifestyle. Mi3 is a nice look phone which is slim and has a 5" display. Given the price of 13999 and specification of the mobile phone, i would prefer to buy this phone and enjoy its fluid performance. Not to forgot the features that we get in this phone for Rs. 13999 is equivalent flagship phones manufactured by Sony, Google, Samsung. Note Moto G which cost around the same price is no way near the specs of this phone.